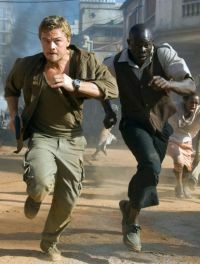 There’s been a lot of talk about “The Blood Diamond,” Ed Zwick’s drama about diamonds’ role in financing a bloody conflict in Sierra Leone in the 1990s. DeBeers has expressed concern that the feature starring Leonardo DiCaprio and Jennifer Connelly, hitting theaters Dec. 15, could take a toll on its Christmas and Valentine’s seasonal sales. More importantly, if the film is deemed an artistic success, what will it mean to awards season? An early predicition: Pearls will be bigger than ever on the red carpet. This entry was posted in Academy Awards by Valerie Kuklenski. Bookmark the permalink.